AWTC helps clients manage risks associated with corrosion within fire protection (sprinkler and standpipe) systems. Corrosion in fire protection systems leads to fouling/plugging problems, reduced performance, reduced service life and water damage if the corrosion results in a leak. These problems create risks associated with life safety, property and business continuity. For wet-pipe systems, microbially-influenced corrosion (MIC) is a growing concern and a leading cause of leaks. Corrosion concerns are not limited to wet-pipe systems. Dry-pipe and pre-activation systems can experience corrosion due to improper installation (pitch) and stagnant water from testing. These concerns are compounded by the use of thinner-walled piping, including Schedule 10 pipe. Through non-destructive testing and destructive pipe analysis, AWTC can evaluate the current condition of fire protection system piping and determine and provide estimates of remaining useful life (RUL) and recommendations for pipe replacement. 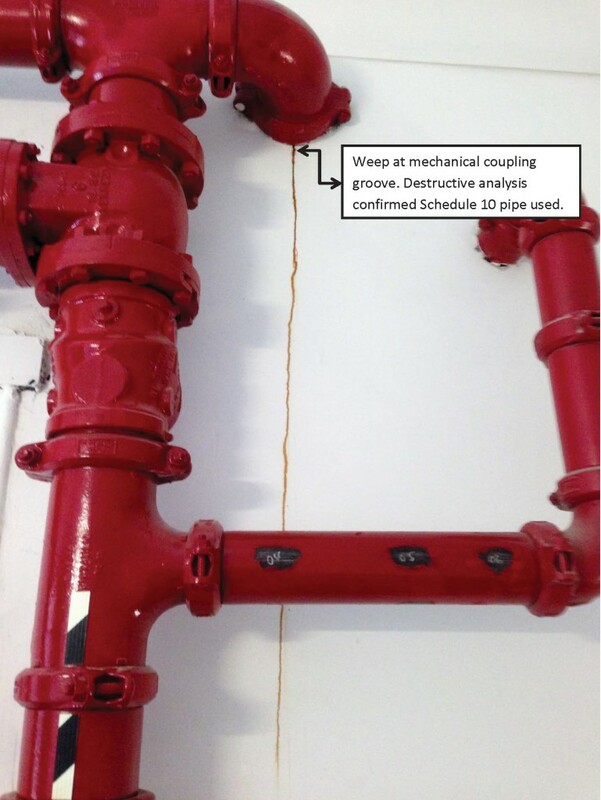 In the event of a leak, AWTC can perform root-cause failure analysis of sprinkler piping and standpipes. AWTC strongly recommends that facilities with dry-pipe systems over five years old and/or wet-pipe systems over 10 years old perform due-diligence testing to assess current conditions. The facility may not be aware that Schedule 10 piping was used in some cases. Testing the piping can help to prioritize for additional surveillance and/or replacement. Through the use of ultrasonic thickness gauging, the pipe schedule can be determined and the presence of general and/or localized corrosion can be detected. Determining the current condition of the fire protection system reduces the risk of catastrophic failure in a time of need.